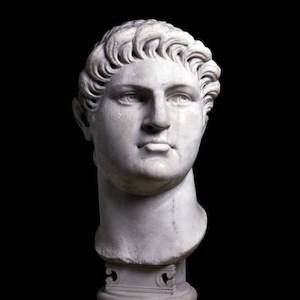 Emperor Nero was one of the most diabolical of Rome’s Twelve Caesars. He practiced Machiavellian rules 1,400 years before Machiavelli wrote them. He used the absolute power he possessed to preserve himself at all costs. To Nero, the end always justified the means. When he burned Rome to the ground in July 64 AD and his heinous act became known, he cast about for a scapegoat to preserve the State—himself. “Not my fault. It’s their fault.” “Change the subject from me to them.” Politics: from Aristotle’s ta Politika, the science of government. 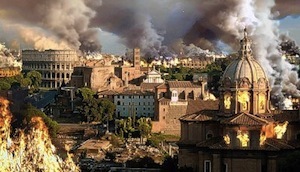 Rome was destroyed by fire in July 64; Tacitus’ story suggests that the Christians were killed in the same summer. An early Christian tradition adds some details, such as the decapitation of Paul and the crucifixion of Peter. That there were Christians living among the Jewish proletariat, is also suggested by the presence of a very ancient church, the SS. Nereo ed Achilleo, which is, in a venerably old legend, connected with Peter’s last days. Both the Capena Gate and this church are situated on the Appian Road, which was also connected with the last days of Peter. Moreover, there may have been some element of distorted truth in the accusation, because the Christians believed that Rome would be destroyed during Christ’s return. They must have responded enthusiastically when they saw “Babylon” burning, and in fact, Tacitus tells us that at least some of them pleaded guilty, i.e. admitted something that their interlocutors interpreted as a confession. 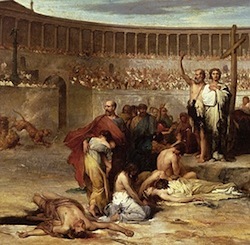 Their execution (in a circus on the Vatican hill, where Nero’s family possessed a villa and a park) was a kind of comic relief to the badly hit Romans. Tacitus’ remark that “they were covered with the skins of beasts and torn by dogs” suggests that several Christians were the unwilling actors in a mythological tableau vivant: the death of Actaeon, a legendary hunter who was devoured by his own dogs. In the First letter of Clement, we also read about women being tortured as if they were the mythological Danaids or the legendary criminal Dirce (6.2). 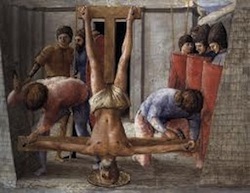 The climax of these cruel shows was the mockery of the crucifixion of Christ: according to a second-century tradition, the Christian leader Peter was crucified upside down.